Old St. Peter's Kirk Preservation Association was formed in 2014 to help protect, promote, conserve and celebrate one of the north of Scotland's most beautiful and historic churches, located in Thurso, Caithness. After a dormant period, we re-formed in 2017 and are looking to take forward ownership, promotion and preservation of this historic Church which is the earliest Christian building in Thurso. Join us as we seek to make the most of this stunning building! 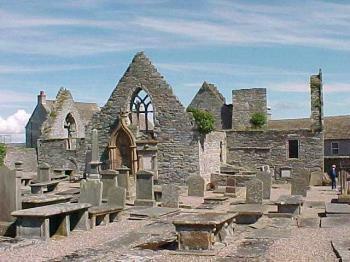 The church of Thurso is dedicated to Saint Peter. Though unnamed in the charter of Bishop Gilbert, it was one of the six reserved by him to the bishopric. Early in the 16th century, the vicarage of Thorso was held by Sir John Mathesoun chancellor of Caithness, on whose demission or otherwise Queen Mary in 1547 presented Master John Craig to the benefice. Master Walter Innes, who appears in record in 1554, was vicar of Thurso in 1560, and continued to hold the vicarage between 1561 and 1566. About 1567, John Rag was minister, and in 1574, Alexander Urquhart was minister of Olrik and Thurso, and John Davidsoun was reader at Thurso. In 1641, Alexander Monro, minister at Durnoch had from King Charles I, a grant of 800 marks Scots or of eight chalders victual in augmentation of his stipend from the rents of the bishopric in the parish of Thurso and elsewhere.